The most efficient way to heat or to cool a house using electricity is with a geothermal system. Let’s first understand why. Typically we cool our homes using electric air conditioners. An air conditioner uses a compressor to pump a fluid through tubes, and this fluid is hot when it’s outside your home and cold when it’s inside your home. By blowing air over the tubes with fans, we cool the inside of the home and transfer the heat to the outside of the home. We can feel this heat when we walk past the outside of an air conditioner in the summer. This process is less efficient when it’s hot outside, because the hot air is less able to carry heat away from the hot tubes. In a geothermal system, the hot tubes are run underground rather than outside. In Central Illinois, the ground temperature a few meters below the surface stays a constant 55°F year-round. The cool ground easily takes the heat away from the hot tubes, making a geothermal cooling system much more efficient than any ordinary air conditioner. For heating, we turn the process around: we take heat from the ground and transfer it into the home. Now the cold part of the tubes is in the ground, and the hot part is in the home. Since the ground is at a relatively cool 55°F, this process is not as efficient as geothermal cooling. But it is much more efficient than the simplest option for heating with electricity, which is to run the electricity through resistors which get hot. While resistive heating is 100% efficient at turning electric energy into heat energy, a high-quality geothermal system in Central Illinois can be more than 400% efficient—for each unit of electric energy consumed, four units of heat energy are produced. Colonial Solar House has a Water Furnace 7 Series geothermal system installed by the local company Design-Air, which has been installing such systems since 1985. The Water Furnace 7 Series system has a variable-capacity compressor, which means that the compressor works only as hard as it needs to and no more. This makes it a very efficient system. I chose Design-Air because of the company’s experience installing Water Furnace systems and their enthusiasm for working on the project. They moved the project along quickly but did not cut corners. I found them a pleasure to work with, and they were always concerned about my satisfaction with the project. The first step is to install the underground tubes called ground loops. In the case of Colonial Solar House, this was done by digging five 150-foot wells in the yard and inserting the tubing into them. I was amazed that the company was able to install the five wells and ground loops in one afternoon. A mini-excavator was then used to dig a trench to connect the wells to each other and to the house. Yes, it does disrupt the yard for a while, because it takes time for the earth to settle wherever it has been dug up, but it’s not too bad. The wells were dug in March 2013, and the trench mounds were leveled and grass replanted in September 2013. The five wells are dug on a snowy day in March 2013. The tubing for the ground loops can be seen coiled up on a spool. 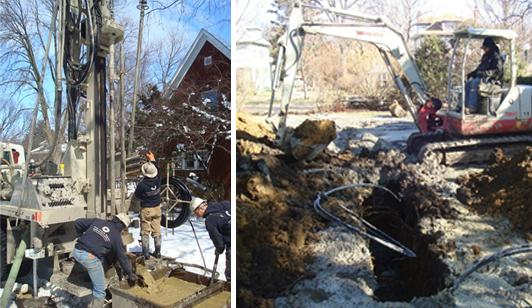 A mini-excavator was used to dig a trench to connect the wells to each other and to the house. The ground loops can be seen protruding from the trench. Here’s what the geothermal system looks like in our basement. The brand name Water Furnace is ironic, because it is not a furnace—nothing is being burned. The technical name for the unit is a heat pump, and if you really want to impress your friends you can call it a ground-source heat pump, which is the more technical description of a geothermal system. The Water Furnace 7 Series heat pump, the heart of the geothermal system. Also shown are the preheat tank (gray) and the water heater (white and red), which are discussed below. Whether in heating or cooling mode, the compressor gets hot and needs to be cooled. Why not use that to heat water? That’s exactly what is done. There is a preheat tank (gray in the photo) that is an ordinary electric water heater, which is merely used as a water tank. Water is drawn from the bottom of this tank, run past the compressor, and returned to the top of the tank. The actual water heater (white and red in the photo) then draws the preheated water from the preheat tank and heats it up to a preset temperature (120°F). 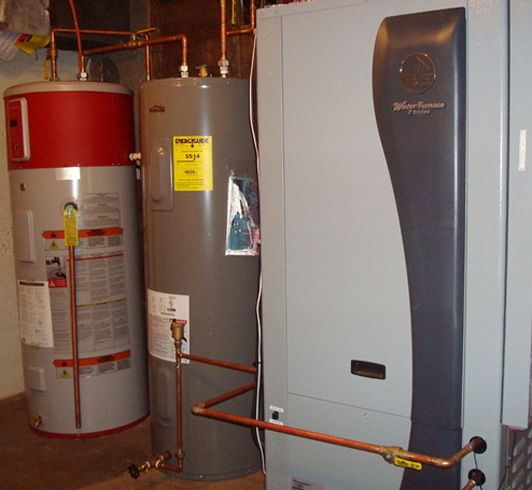 This system greatly reduces the amount of energy the water heater uses. That white and red water heater is not an ordinary electric water heater. It’s a heat pump water heater, more than twice as efficient as an ordinary electric water heater. It’s a different heat pump than the Water Furnace heat pump—it draws the heat from the air in the basement rather than from the ground (which makes it an air-source heat pump). I’ll let you read more about that in the Appliances section. The Water Furnace heat pump delivers hot or cold air to the house via the existing ductwork. One nice feature that Design-Air added was a damper that splits the house into two zones, upstairs and downstairs. This allows you to control the temperature of the two zones independently. In the winter we set both zones to 72°F and in the summer we set both zones to 77°F. The real value of the zoning system is that in the winter, more hot air is delivered downstairs, because the upstairs naturally stays warmer due to the fact that hot air rises. In the summer more cool air is delivered upstairs, because cool air sinks. This increases the efficiency of the system, and the temperature in the house stays very well balanced. The geothermal system also has a 15-kilowatt resistive heating element, which serves two purposes. First, if the weather were very cold for an extended period, the heat pump might not be able to keep the house at 72°F, and the resistive heating would turn on to supplement the heating of the house. Second, if the compressor were ever to fail, the resistive heating should keep the house warm enough that the pipes wouldn’t freeze. I keep the resistive heating turned off, because I don’t want it to come on unless we really need it (I turn it on if I am away from the house for an extended period in the winter). The system might use resistive heating just to warm the house up quickly, and I want to avoid that. Remember, the heat pump is four times as efficient as resistive heating. If the resistive heating were to come on all the way, it would draw about 60 amps of current. That is quite a lot, and it raised the issue of whether I needed to increase the amount of current that could be delivered to my house. The main electric panel in my house was rated for 200 amps maximum. One geothermal installer told me that I needed to upgrade this to 400 amps, which would cost me about $7,000. Design-Air told me that I was fine with 200 amps. The City of Champaign electric inspector approved the system after it was installed, and I later asked him about 200 vs. 400 amps. He said that he knew from experience that a house such as mine would be fine with 200 amps. My advice to you is to consult with the city electric inspector before considering an upgrade to your electric service. A fringe benefit of a geothermal heating system is the reduced need for humidification in the winter. A natural gas furnace draws air from the house to burn with the gas, and this air is replaced by cold, dry air from the outdoors. With a geothermal system, there is no combustion, so no replacement air is drawn. Since Colonial Solar House is all electric, I closed off the flue that was used to vent the furnace and the gas water heater, which increased the air-tightness of the house. We found that we did not need a humidifier, even in the very cold winter of 2013-2014. Geothermal is quite expensive to install, in part because it requires drilling wells in your yard. Fortunately, the cost is offset by a federal tax credit of 30% (good through 2016). Let’s compare my geothermal heating and cooling system with a system composed of a natural-gas furnace and a conventional air conditioner, all of high quality. Not only do I save on my heating and cooling costs, but my geothermal system produces about half of my hot water, which I will also figure into my energy cost savings. The price tag on my geothermal system is about twice that of the gas furnace/AC system; after the federal tax credit of 30%, the geothermal system costs about 40% more than the gas furnace/AC system. The money I save on energy corresponds to an annual return of 17% of the price difference between the geothermal system and the gas furnace/AC system. That’s an impressive return, especially when you consider that it’s tax free and ignores any increase in energy prices. Our geothermal system is quieter than our old gas furnace. We also had the pleasure of removing the hot and noisy outdoor air conditioning condenser, which makes our yard a more pleasant place to be in the summer. Expect your out-of-pocket cost (after the federal tax credit) to be in the $13,000 - $16,000 range, depending on the size of your system. There will be an additional cost of a few thousand dollars if you add zoning. If you live in your house long enough to need to replace the geothermal system, you will only need to replace the heat pump; the ground loops will last 50 years or more.